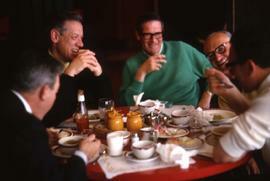 Colour Kodachrome 35mm slide depicts five unknown men sitting around a table eating. Colour Kodachrome 35mm slide depicts four unknown men posing for the camera and the man in the centre right is holding on to the blue hat of the man on the farthest right of the image. Colour no known brand 35mm slide depicts four unknown men posing for the camera and one of the men has a piece of paper in his hands. The image was likely taken at the Richmond Golf and Country Club. 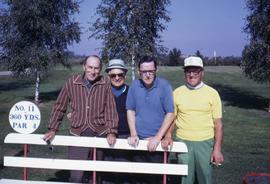 Colour Kodachrome 35mm slide depicts four unknown men posing for the camera. The man on the far right of the image is looking to the left of the image. Colour Kodachrome 35mm slide depicts four unknown men posing in front of a building with a white and brown striped awning. Colour Kodachrome 35mm slide depicts four unknown men standing in front of a building looking to the right of the image. Colour Kodachrome 35mm slide depicts four unknown people posing for the camera all wearing blue cardigans and two of the people are wearing red labels on their cardigans. Green car parked with an orange sign on the side that says: "Dueck Hole in One Prize"
Colour Kodachrome 35mm slide depicts a green car parked on grass underneath trees with an orange sign on the side that says: "Dueck Hole in One Prize". Colour Kodachrome 35mm slide depicts a group of people dressed in colouful clothing sitting on hay. They are likely sitting on a hay bales.